Hungarian nutroll is one of my family’s most treasured recipes – but this version has slightly less fat since it’s made with skim milk . Don’t worry about the high quantities of butter or nuts in this recipe, since it make 4 large rolls, enough to share with family, neighbors, and friends. Fresh yeast is usually found in the dairy section, but you can substitute with 2 (.04 ounce) packets of dry yeast. Prepare the dough by placing a stainless steel bowl directly on the stove (low heat), with 1 tablespoon of the sugar in 1/4 cup of the milk. Once the sugar dissolves,pull the bowl off the heat. Add the cake of yeast or instant yeast, stirring until it melts (milk temperature should be between 72-85° F). Allow the mixture to cool slightly. Beat in 4 egg yolks, the remaining milk, 1 cup of the butter, and vanilla. Onto a piece of wax paper or aluminum foil, sift the flour, salt, and remaining sugar. Gradually stir it into the yeast mixture until it forms a soft and slightly sticky dough. Knead until the dough no longer clings to the fingers. Add more from the 1/4 cup of flour if the mixture is too sticky (remember that this is a dessert dough and should be lighter in texture than a bread dough). Cut dough into 4 equal parts and wrap loosely in wax paper. Let rise in the fridge overnight or on the counter for 3-4 hours, until it has doubled in size. Prepare the filling by mixing all filling ingredients in a large bowl (Note that the filling can be prepared the night before and stored refrigerated). Dust your work surface with powdered sugar and roll out dough into an rectangular disk, 1/2 inch thickness, about a yard in length. Preheat the oven to 350° F. Spread on the filling with a spatula, leaving a 1/2 inch space around the edges. For a variation, I’ve made my own marzipan and added candied oranges and golden raisins to the filling. Granny also uses off-the-shelf poppy seed filling (Baker brand), which is just as delicious as the nut filling. Once the filling is well distributed, gently pull up the edge closest to you and begin to roll the dough over the nut filling into a log. Be careful that the dough doesn’t stick to your work surface – use your thumbs to push the dough slowly over onto itself. It’s better to work with a somewhat sticky dough vs. adding more powdered sugar though, since this will make the dough tough. After you have rolled the dough into a tight cylinder, smooth the seam with your fingers and pull the ends up and tuck them over to seal. Granny always emphasized to press on the ends – this ensures that the filling won’t burst out of the ends. After preparing all four rolls, set them seam-side down on an ungreased baking sheet. Baste the top of the rolls with the two tablespoons of extra butter. Pop your treasures into the oven. They might burst at the seams (mine often do), but that’s the beauty of a truly home-made, rustic family recipe. Once they are browned lightly on top, remove them (after about 25-30 minutes). Once they have cooled completely (about 90 minutes), don’t forget to wrap them tightly, so they don’t dry out. I’m convinced that they are moister if you allow them to sit a day or two. When you are ready to serve, cut the rolls into 2 inch thick slices with a serrated knife and place them on a decorative tray. If you are not planning on serving right away cover it with saran wrap or wax paper. Nutritional Stats Per Serving (1 slice, 6-inch x 2-inch): 164 calories, 3 g protein, 18 g carbohydrates, 8g fat (2 g saturated), 20mg cholesterol, 1g fiber, 54 mg sodium. Thank you so much for this recipe! My grandma makes this, and it is so great! I think I could attempt it to share with my family…my husband liked the csirke paprikas I made!! For the ground walnuts, do you buy regular walnuts and ground them up? Or can you buy them already ground? Thanks, I just love this recipe, reminds me so much of home. Sure you can just buy a pound of walnuts and grind them in a food processor. My mom makes this every Christmas and it’s absolutely delicious! I made it myself this year and nobody could tell the difference. But I have a question: our family has always called this recipe Kolache (ko-law-chee). I searched online and found a different recipe where small balls of dough are baked, then a filling is added on top. Have we been wrong all of these years? Have we been making a Hungarian Nut Roll, not Kolache?! 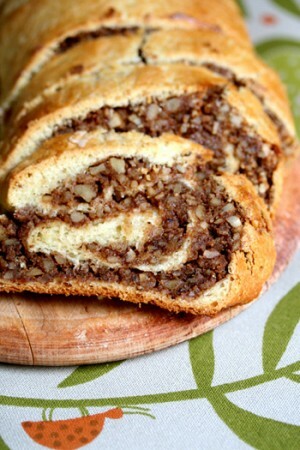 Nut roll is a popular dessert that can be found in almost every Eastern European country. Kolache is a very similar recipe, only the shape of the “cakes” as it translate is different. Unfortunately, no one in my family still speaks Hungarian so I’m not sure of the original name for my version. Perhaps I should go to Hungry some day to find out!! Could anyone provide additional information on how to change the pastry recipe for high altitude. We live in Denver at 5,860 ft. I have never seen any information on how to modify the recipe for this altitude. where does one buy fresh (compressed) yeast in Denver? What is the conversion to dry–my recipe calls for one tablespoon of compresed yeast? What is the ratio for dry yeast? I’m in Lawrenceville, GA (Atlanta) and have never seen cake yeast here. Also, Could I use whole eggs in the dough and filling? If so how many? Would it be best to use only yolks in the dough? How many whole eggs in the filling? I appreciate you taking the time to answer my questions. I had my mother-in-law’s recipe for the nut roll and have lost it, so any help you can give me is truly appreciated. After rolling and filling the dough, should the rolls not be left to rise before baking? Once they are filled they go straight into the oven. That’s the way I’ve always been taught, let me know how yours turn out! My mother used to make Hungarian cookies with a similar nut filling. She sometimes filled the cookies with apricot or lekvar and sprinkled powdered sugar over them. Unfortunately, I don’t have the cookie dough recipe and don’t know what they were called. They were little squares filled with the filling and two opposite corners were pinched together. Does anyone have that recipe. They are called Roszke cookies or Kiffles 🙂 pintrest has done great recipes. WOW What a recipe! My husband could not believe how close this bread came to tasting like his Hungarian grandmother’s. He said his grandmother always left one end of the loaf open & then the top did not split. I intend to try it next time to avoid the bursting at the seam situation. Charlotte I have the recipe from those cookies, our family makes them every year. I would be happy to share with you! I made mine this year by doing it in the dough program of my bread machine. It cut the time dramatically! This recipe is AMAZING. It makes a ton but that’s ok, it’s delicious. I subsituted one of the sticks of butter with cream cheese which gave it a bit of tang. Otherwise, I folled the recipe to a T and it tasted and even looked great, with nice rolls of nuts like your picture. I will be making again for sure! thank you! Is it ok to use both oven racks when baking the nutroll? Yes absolutely, just allow them to cool completely. I wrap them first in a layer of wax paper and then roll in aluminum foil for extra protection. You forgot about lemon zest in the dough! Really? There’s no lemon zest in nutroll! Do you put it in your version, that does sound divine! When I mixed the nuts, egg white, and sugar. I made to much. How long can I keep this mixed in the refrigerator or the freezer. Help. Really? I’m wondering if you didn’t roll out the dough thin enough. You can stuff left-over filling it into cored apples and bake them at 350F for 45 minutes.